Elective egg freezing, also known as oocyte cryopreservation, is an option chosen by women looking to preserve their current fertility level while delaying motherhood for a variety of reasons, including career, education, lifestyle, and relationship status. 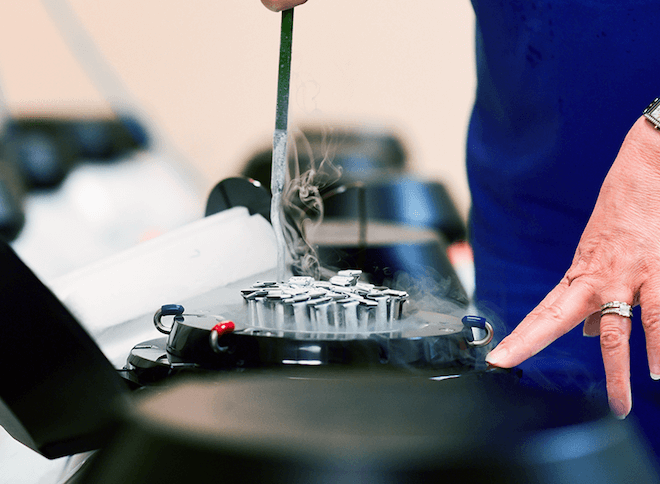 Egg freezing is a proactive treatment that secures a reserve of eggs, effectively “putting them on ice,” where they can be stored for years and then accessed at any point in the future to be thawed, fertilized, and implanted to achieve pregnancy. RMA of New York’s cutting edge laboratory utilizes the latest advanced cryopreservation technology, called vitrification, which has revolutionized the ability to freeze and successfully thaw frozen eggs. Vitrification is an extremely successful technology and has resulted in the survival of well over 80-90% of eggs frozen and consistently achieves high embryo survival rates. Women are at their most fertile in their early to mid-20s, after which a steady natural decline in both egg quality and quantity begins and negatively affects the ability to become pregnant. Younger eggs therefore offer a better chance of achieving a healthy pregnancy, which conflicts with the fact that it is very common for women to delay childbearing for a multitude of reasons. Fortunately, advances in egg freezing technology have made it possible to safely and successfully retrieve and freeze unfertilized eggs to be used whenever a woman is ready to start a family. At RMA of New York, our goal is to provide you with options that meet your desires for a future family. We offer you the opportunity to stop your biological clock by retrieving, freezing and storing your eggs during your fertile years so those healthy eggs will be available to create your family in the future when you are ready, thus reducing concerns about an age-related decline in fertility. Though years may go by, the eggs remain the same age they were when retrieved, greatly improving your chance of conception in the future. Our use of innovative cryopreservation techniques has resulted in both a high survival rate when thawing cryopreserved eggs and healthy babies born following fertilization and transfer. Both the egg and embryo freezing processes start much like traditional IVF. Medications are taken to stimulate the ovaries to simultaneously mature multiple eggs that can then be retrieved from the body. The egg freezing process generally takes less than four weeks from start to finish. Prior to starting, an initial consultation with one of our physicians must take place during which our physicians will discuss your family-building goals, assess basic fertility parameters, and review your medical history. Then, you will prepare for the egg freezing process with the help of our clinical team by learning about ovarian stimulation, how to administer medications, and the egg retrieval/freezing process in addition to completing some basic testing to assess general health prior to treatment. Fertility medications are prescribed and self-administered daily to stimulate the ovaries and mature numerous eggs at once. Most often, having a greater number of eggs improves the chances of fertilization, and, ultimately, a future pregnancy. While administering your medications, you will come in to the office approximately every other day for a short monitoring appointment to assess your progress. Medication adjustments are then made based on the results of your monitoring visits in an effort to highly personalize your treatment to your own individual medication response. When multiple eggs have matured and are ready, one of our physicians will perform an egg retrieval. This procedure takes approximately 15-20 minutes and is done so under general anesthesia. Using an ultrasound, your physician guides a needle through the vaginal wall and into the ovaries to gently draw the eggs from their follicles into sterile test tubes. The egg retrieval procedure takes place right in our facility and is performed under sedation. It generally takes about twenty minutes, followed by a stay of approximately one hour in our recovery room. After the eggs are retrieved, they are transferred to the embryology laboratory. The retrieved eggs are evaluated, and those considered mature are frozen. We provide safe, secure long-term laboratory storage right in our primary office at 635 Madison Avenue in New York City. When you are ready to conceive, the eggs are carefully thawed and injected with sperm. The resulting embryos are transferred into the uterus. The development of an advanced cryopreservation technique called “vitrification” has allowed for very high egg survival rates. At RMA of New York, our successful thaw rate is over 90%. Thousands of babies have been born worldwide from eggs that have been frozen and thawed, and studies have revealed no apparent increase in chromosomal abnormalities or birth defects. In fact, the American Society for Reproductive Medicine no longer considers egg freezing an ‘experimental’ procedure, and recent findings show that frozen eggs are yielding successful pregnancies and healthy babies at rates comparable to those achieved through in vitro fertilization cycles using fresh eggs. The cost of egg freezing may be partially covered by your health insurance. The level of coverage, if any, depends on the type of insurance plan you have. One of our Financial Services Coordinators will help you navigate your insurance coverage and discuss your out of pocket expenses for the procedure.